My grandmother's signature dish. She originally got the recipe from the Claridge Hotel in NY. 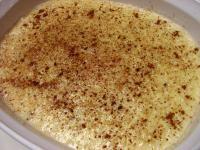 This is a custard style pudding and is a family favorite. I can only make this one rarely, for special occasions, or I will be tempted to eat the entire batch. This takes a long time stirring, so having someone handy to help stir is a real plus. I have tried various milks in this, and the less fat the milk has, the longer it takes to thicken, so I highly recommend going with whole milk only...unless you enjoy stirring pudding for over an hour. Grandma usually would offer Cool Whip on the side as a topping, although I prefer no topping. When you chill this, leave off the cover or it will develop a "skin" - although as a kid, I would ask my grandma to cover my portions because I always liked it to have a "cinnamon skin." Once it is fully cooled, you may cover it. 1. Put rice and milk in a 3 quart saucepan bring to just a boil, stirring constantly and watching the pot like a hawk so it doesn't burn or boil over. 2. As soon as it just starts to boil, lower the heat enough to maintain a gentle simmer without burning the milk, and simmer for about 30 minutes or until the rice is very soft, keep stirring, so the rice does not stick to the bottom. 3. Once the rice is soft, slowly stir in the sugar, vanilla, and nutmeg; it will still seem quite wet (this will thicken more upon cooling). 4. A test for doneness is to stick a wooden spoon into the custard and then see if it coats the back, swipe your finger down the coating and see if the line remains;it is ready then. 5. Ladle out a small amount of the custard base into a small dish and add the beaten eggs to it, whisking quickly, to temper the eggs. 6. Return this mixture to the pot and stir. 7. Cook another minute or so (to cook egg), then pour into a 2 quart casserole. 8. Dust top completey with cinnamon or nutmeg. 9. Chill well and serve nice and cold with Cool Whip if desired.